Two of the most seemingly intractable conflicts in modern history were over apartheid in South Africa and “The Troubles” in Northern Ireland. As we know, they were eventually resolved, although neither country is entirely free of the toxicity their respective histories engendered. South Africa’s political “miracle” has attracted a spate of documentary and feature films; now it’s the turn of Northern Ireland with this curious film. In October 2006, the parties to the conflict gathered at St Andrews in Scotland to restore the Northern Ireland Assembly and put an end to The Troubles. We know they were successful and that Calvinist firebrand the Rev Ian Paisely was appointed First Minister in the Stormont parliament the following year with former IRA member and later Sinn Féin MP Martin McGuinness serving as his deputy. This film, scripted by Colin Bateman and directed by Nick Hamm, imagines just how the icy relationship between the two men melted to such a degree that a lifetime of mutual hatred was transformed to such an extent that they were dubbed the “Chuckle Brothers” in Stormont. The highly contrived plot has it that Paisley (Timothy Spall) has to interrupt the conference at St Andrews to fly home to Belfast to attend his 50th wedding anniversary. McGuinness (Colm Meaney), sensing an opportunity to make a diplomatic breakthrough, insists on travelling with him, first in a car to Edinburgh airport, and then by plane to Belfast. The movie cliché about odd couples resolving disputes on a journey is eagerly embraced, and this road movie includes moments of humour and even farce to sweeten the inevitable political verbals. The key ingredient that helps us to suspend our disbelief over some of the artificial plot machinations is the chemistry between Meaney and Spall who deliver excellent performances. 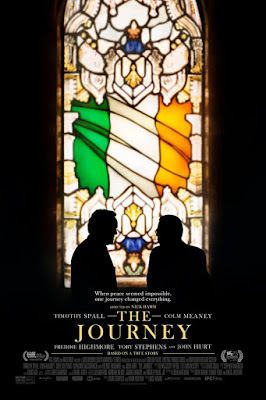 Meaney has the easier task as the amicable, warm-hearted McGuinness who tries (unavailingly at first) to get through to the hostile, ultra-defensive and fanatically religious bigot that is Paisley. Spall’s tortuous Irish accent seems to be shaped by his struggle with his huge artificial teeth as much as anything else. As the journey progresses, however, and certain unexpected events occur, the frigid atmosphere begins to warm up. While the political debate rages between the two antagonists, other factors, not least their shared nationality and even the way they talk, help to move things along, sometimes with a chuckle. In terms of dramatic impact, the film is virtually a two-hander, although Freddie Highmore is good as the young government agent posing as a chauffeur, while there are minor roles for Toby Stephens as the oleaginous British Prime Minister Tony Blair and John Hurt – in one of his last roles before his death in January this year – as MI5’s Harry Pattinson.